Streaming in the US on Hulu. 85% fresh on RT. Im confused. Is it The Cleanse or The Master Cleanse? Both, sort of. 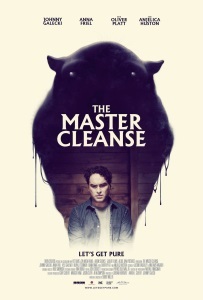 I think it may have played some film fests as The Master Cleanse before adopting the shorter title. I guess the poster that got picked up from iMDb has the old title, which is confusing. So....I'm ambivalent about this film. It's a nice easy watch, but when you begin to think about things, the film falls apart.